To the north of Cardiff near the picturesque Castle Coch, this branch is situated a few minutes from junction 32 of the M4 just off the A470. As one of our biggest shops, this branch is truly an aquatic superstore and has something for every fishkeeper. The centrepiece of the fish area is a truly oceanic display tank worthy of a public aquarium. This remarkable aquarium measures 10.5' x 10.5' x 3' (3.8 x 3.8 x 0.9m) and holds in excess of 2,000 gallons/9,500 litres. The store has over 300 aquariums in total, stocked with tropical, coldwater, marine fish & invertebrates. The extensive and well-stocked fish house caters for many areas of the hobby with both familiar and unusual community species displayed. A large dedicated system houses a varied selection of fancy goldfish with everything from hardy comets up to the more delicate pearlscales and orandas for the more experienced goldfish fanatic. The stores dispaly tanks include Asian Arowana, hard corals(SPS & LPS), soft corals & a 10 foot fancy Goldfish tank. Both marine fish and reef aquarium keepers are catered for but in reflection of recent trends, most fishes offered are suitable for the home mini-reef and more aggressive or destructive fish may be supplied to order. The Cardiff store currently have freshwater Stingrays in stock, including Motoro & Tiger rays which the shop intends to breed on-site in the near future. Outdoor fish are housed in the pond section where separate systems contain High-grade Koi from proven KHV and SVC free sources. These range from modestly priced UK young stock to select Japanese fish for the more discerning enthusiast. Nearby vats contain a very full range of pond species including shubunkin, sarasa comets, goldfish, orfe, rudd and tench in addition to more unusual specimens such as sterlet. Pond plants are also to be found here and a large assortment can be found throughout the pond season. The store is a Red Sea dealer stocking the full Red Sea range of dry goods for the advanced marine hobbyist. They also have 2 Red Sea Max aquariums set up as coral displays. As might be expected from such a large store, a very good selection of watergardening and aquarium accessories is held in stock, including everything needed for projects both indoors and out on any scale- from stone monoliths to aquarium airstones. A varied choice of tanks and cabinets is available with the largest display of solid oak aquariums in the country and home delivery can usually be arranged on these and other bulky items. . There is also a tea/coffee area in store. All staff are avid fishkeepers, specialising in reef aquariums, Cichlids & Catfish. Our Cardiff staff can also visit you at your home or workplace for any aquarium or water gardening projects. Advice can be found in store on pond plants or fish and filtration for any size pond or lake. 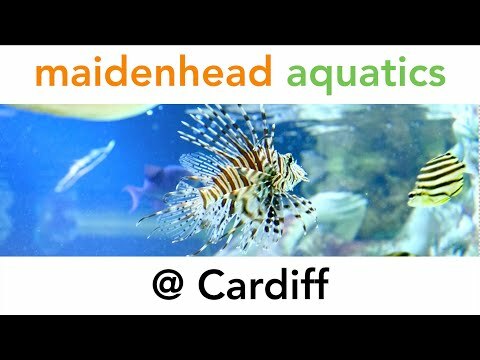 If you are keen to see fishkeeping on a grand scale and would like the widest choice of livestock from the biggest store in Wales, a visit to our Cardiff branch is a must.